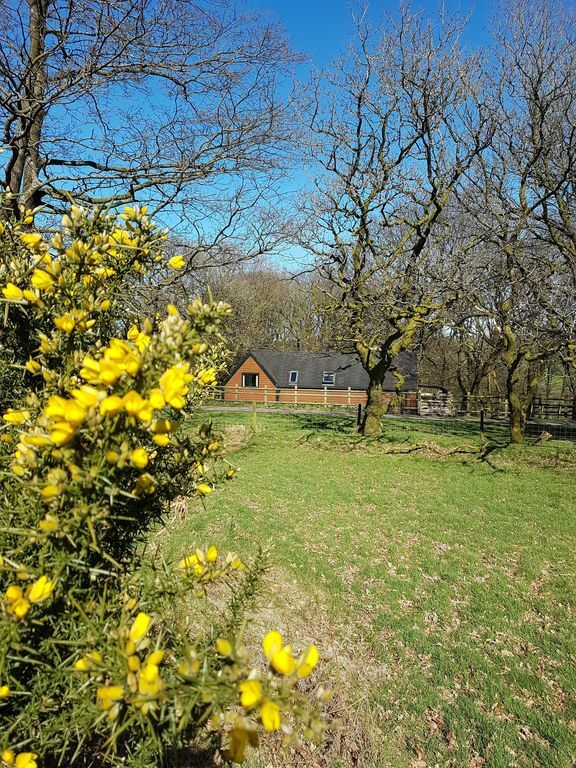 Set in a stunning location within 20 acres of countryside and lying next to an iron age hillfort and a beautiful lake, Hillfort Cabin is a place to stay to escape it all! Hillfort Cabin comfortably sleeps 4 adults, with one king and one double bedroom. There is a bathroom (over bath shower), kitchen with all the essentials including an electric oven, microwave, kettle and toaster, and a comfortable living room with a log burner to warm up those cold nights. Please note that the bathroom is for showering only (not bath), this is because the water system that the cabin is on does not provide enough hot water to fill a bath. If you require a non slip mat for the shower there is one in the cupboard opposite the bathroom. Rates per night range from £75 in low season up to £130 in high season plus Homeaway booking fees. 1 night stays have an extra £30 charge and are only considered for short notice bookings - please message us to enquire first. Unfortunately there is no Wi-Fi available (welcome to rural Devon!). There is parking available next to the cabin for up to 2 cars. You are welcome to explore the 20 acre of magical countryside at your leisure, which includes woodlands, a lake and of course the iron age fort. On a clear day you can see sea views to Hartland Point in Cornwall, and on a clear night the stars are breathtaking! There is plenty to do and explore during your visit, with both the coast and Exmoor national park just 10 miles away. Why not try your hand at surfing at the nearby Woolacombe, Croyde and Saunton beaches, hire a bicycle and ride the famous Tarka Trail, go hiking in Exmoor or walk the South West Coast Path. Arlington Court and Castle Hill Gardens are also very close if you enjoy visiting historical country estates, or for something different try nearby Quince Honey Farm. There’s plenty for kids too, such as the Exmoor Zoological Park, Milky Way Adventure Park and Combe Martin Wildlife and Dinosaur Park. Check us out on popular social network sites for more information, photos and posts - just search Hillfort Cabin! Please note that the bathroom is for showering only (not bath), this is because the water system that the cabin is on does not provide enough hot water to fill a bath. If you require a non slip mat for the shower there is one in the cupboard opposite the bathroom. A selection of board games are provided, found in the cabinet in the double bedroom. A selection of DVDs are available to watch. Dispite the weather this is a lovely place to stay. Great peaceful setting. Great comfortable place to stay. Plenty of room, everything you need to cook a nice meal and lovely welcome cookies. Love the logburner, it’s a nice touch and the decking would be great had it of been summer. Maybe some other time, I would definitely stay again. Very pleasant stay. Helpful owner. Middle of nowhere, cosy feel with woodburner etc. Owls, deer and ravens in big, dog friendly fields. comfortable cosy cabin in a nice setting. Fields outside were great for walking the dog who could remain off lead as there were no roads. Nice to meet Matt and the dogs. The beaches were about 20 minutes drive away, we really enjoyed Woolacombe beach. The wood burner was good to have as it kept us warm and cosy through the storm on our last evening. Thank you for leaving this feedback and we are so glad that you enjoyed your stay! Do think of us if you ever plan a trip back to north Devon. Ideal base for exploring North Devon and Exmoor. Ideal accommodation for taking the Cockers away for the week in North Devon. Lovely cabin set under a canopy of trees at the end of a farm road. (Tarmac). Totally enclosed garden with a gate next to fields which are also dog friendly. The cabin must be left in a reasonable clean and tidy condition. This includes the kitchen washing up and drying up. An additional fee of £25 will be charged if the cabin is left in an unreasonable condition. 1 night stays will only be considered for short notice bookings where there is availability. There is an extra charge of £20 for 1 night stays. Please message us to enquire first. Whilst we are very pet friendly, please note that pets are not allowed on any furniture inside the cabin. All dog poo must be picked up and disposed of in the outside waste bin provided. There is a £25 charge if dog mess is not cleared up, so please remember! There is a charcoal BBQ that you are welcome to use, but please make sure it is cleaned afterwards. There is a £25 charge if left unclean.